Sweet treats are rare for me at the moment, as I am trying to eat healthier and have been doing really well. However, when I was told about the brand new revised Rowntrees sweets; I couldn't turn down trying them out. 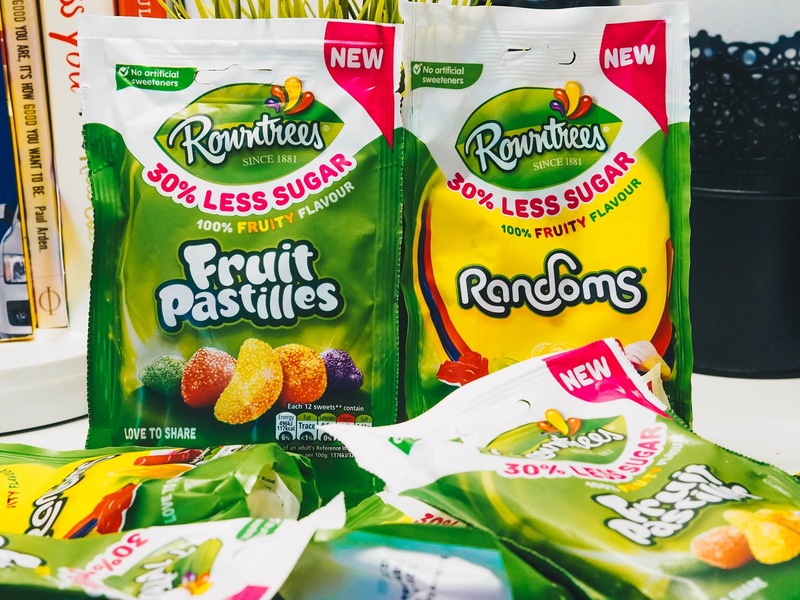 Nestle's Rowntrees has unveiled a brand new version of their best selling sweet products; fruit pastilles and randoms. They now have 30% less sugar - with fibre content being replaced instead. They have fewer calories too and remain free from artificial flavours, colours and sweeteners. I have been snacking on Rowntrees Randoms all week, whilst getting tasks ticked off of my never-ending-to-do list. I noticed immediately how much fruiter and better tasting they are. Sometimes, I find sweets are too 'sweet' for me (pardon the pun) and so I try not to eat too many. However, these have been enjoyed guilt free. The Pastilles are also really nice and less chewy and somewhat hard to get through. I always used to avoid the original ones, but I can now actually enjoy them without feeling like I'm going to crack my teeth! I was also really happy to see there's many more red and black pastilles in a pack. I always found I bought a pack that was lumbered with too many greens and yellows! By 2018, Nestle are hoping to remove at least 10% of sugar across its confectionary range by 2018. It will be interesting to see if they follow through with this announcement. Hopefully, we can enjoy our favourite Nestle sweet treats with no guilty feeling of ingesting too much sugar. 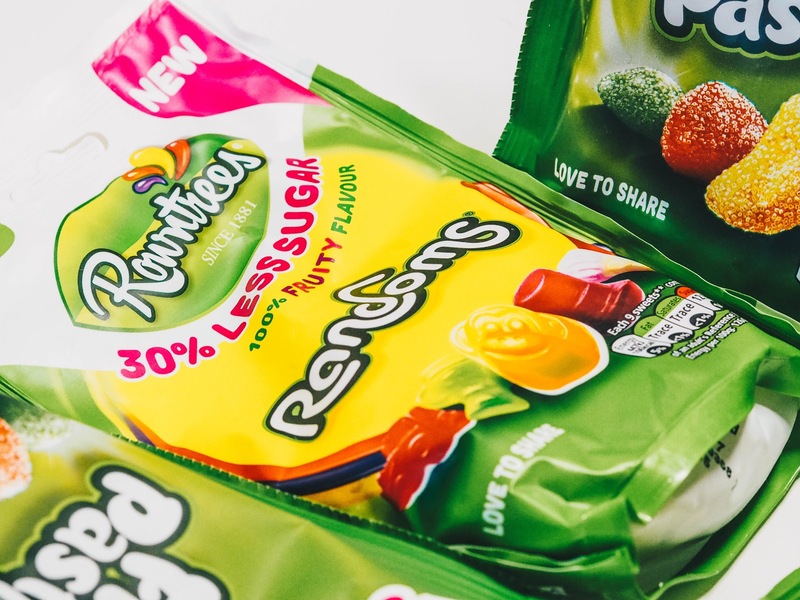 Priced at £0.51 for a single pack of Rowntree’s® Fruit Pastilles or Rowntree’s ® Randoms® and £1.29 for sharing pouch. These are available at all UK supermarkets. Nice! I have a bit of a sweet tooth as well but I've cut down so much on sugar and I tend to eat fresh fruit instead. However, I love Rowntree's sweets and I'd love to give these a try now that they've got less sugar! This sounds like the perfect excuse to eat more sweets to me. I'll have to try these out! I have had a bag of the randoms this week and was so surprised by them. They really do taste better and guilt free sweets are always the best kind! I'll look out for the pastilles next time I'm shopping. My first question is usually to know what the sugar has been replaced with. It's good to know that the sugar has been replaced with fiber and not tonnes of artificial sweetener. Good to know that confectionary companies are trying to reduce sugar, will have to try these out. Less sugar is always a good thing, in fact, zero sugar is even better! I used to love this stuff so much -- just couldn't stop eating them at one point LOL. Am as happy as a pig in mud! The best thing about this is as they've reduced the sugar, I can eat more, right?